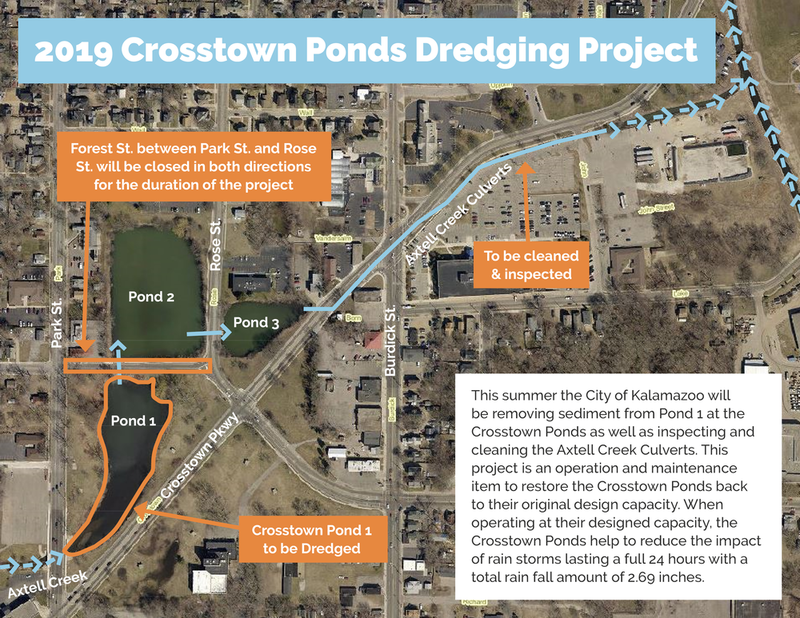 This summer the City of Kalamazoo will be removing sediment from Pond 1 at the Crosstown Ponds as well as inspecting and cleaning the Axtell Creek Culverts. This project is an operation and maintenance item to restore the Crosstown Ponds back to their original design capacity. When operating at their designed capacity, the Crosstown Ponds help to reduce the impact of rain storms lasting a full 24 hours with a total rain fall amount of 2.69 inches. Sediment will be removed from Pond 1 which is bordered by Park St. to the west, Crosstown Pkwy to the east, and Forest St. to the north. Equipment will be set up on Forest St. and will enter the pond at that location. Forest St. between Park St. and Rose St. will be closed in both directions for the duration of the project. Some vegetation will be removed from Forest St. during the project. Forest St. was chosen because it has the least amount of vegetation so that as little impact as possible would be made to the surrounding vegetation. Once the sediment is removed from the pond the water will be taken out of it and put back into the pond before sending the sediment off-site. Removing the water helps to reduce the weight of the sediment to haul, therefore lessening the impact on our roads. Different parts of Rose St. will be impacted by the dewatering phase. During the second phase of this project, the quality of the Axtell Creek Culverts along Crosstown Pkwy will be examined and sediment will be removed from the culverts to clean them as necessary. For this phase there will be equipment in the streets along Crosstown Pkwy and Burdick St. with minor traffic control. Stormwater from Axtell Creek flows into the Crosstown Ponds, first through Pond 1, then through Pond 2, and finally through Pond 3, dropping sediment in the ponds as it travels. The water then flows through the Axtell Creek Culverts before ultimately reaching the Portage Creek. The Crosstown Ponds allow sediment to settle out of the traveling stormwater into an accessible area, which allows for routine maintenance efforts. This stormwater system is not connected to the sanitary sewer system. The City of Kalamazoo is unique in the fact that it has a Separate Sewer System meaning that sewage and stormwater are diverted into different pipes. Equipment moves in on Forest St. Restore Crosstown Ponds back to its original design capacity. The City of Kalamazoo is currently working with the U.S. Army Corps of Engineers to develop hydraulic modeling and flood inundation mapping for the Kalamazoo River, Portage Creek, and Axtell Creek. The objective of this study is to provide real-time flood inundation maps for emergency response as well as to better understand the river dynamics including flow characteristics and flooding impacts from different scenarios. The model and results of this study may be used in consideration of future floodplain mitigation and emergency management. At the request of a property owner, the City of Kalamazoo will install a sanitary sewer backflow preventer on the property’s sanitary sewer service. If a public sanitary sewer becomes overly full, backflow preventers can help prevent public sewage from flowing backwards into a private sanitary sewer. The order in which backflow preventers are installed is based on the level of urgency for each property. Proper care and maintenance are required for the backflow preventers to function properly. In rare cases, backflow preventers may cause sewage from being able to flow from the private sanitary sewer which may cause backup into the building. In these cases, stopping the use of water facilities on the property will stop the sewage from flowing back into the building. Call 269-337-8148 for more information.